As Jews, support of Israel must always be a priority for us. But what does that mean? Is it possible to support Israel when you don't necessarily agree with all of its government's policies? And what should that support look like? Our forum used these questions to start a conversation with our panelists, including: Jennifer Raskas, Israel Action Center Director, JCRC of Greater Washington (moderator); Yaron Gamburg, Director of Public Affairs, Embassy of Israel to the United States; Matt Mayers, Chair, DC Metro chapter, J Street; and Alan Ronkin, Director, Washington Regional Office, AJC. 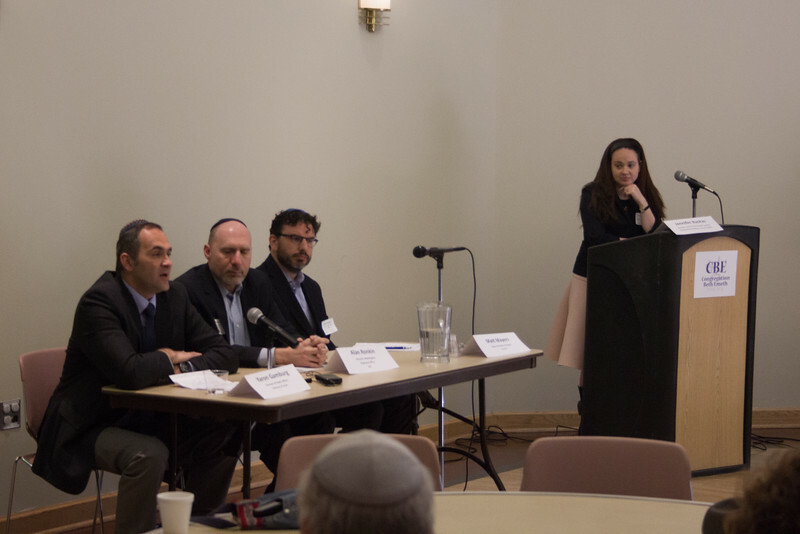 Panelists spoke briefly and then answered questions, after which we had facilitated breakout sessions to discuss how we at CBE and in Northern Virginia can best support Israel. Thanks go especially to Suzanne Stluka for organizing this session, with help from Carol Silberstein, Diane Lowenthal, and Karan Robinson. Photos by Susan Berger.